Do you play guitar competently but want to get beyond the plateau your playing has reached? 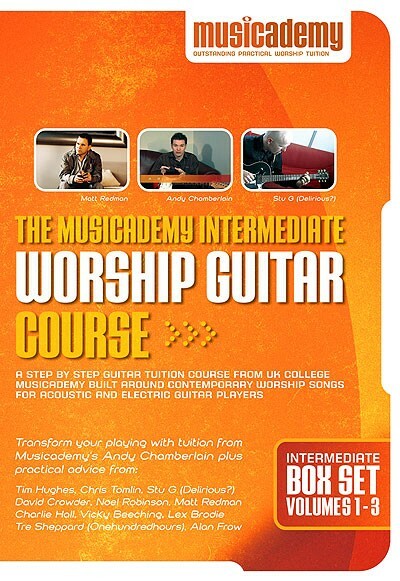 A highly practical step by step programme from Musicademy's Andy Chamberlain, formerly guitarist for Matt Redman, Tim Hughes, Vicky Beeching and Brenton Brown. 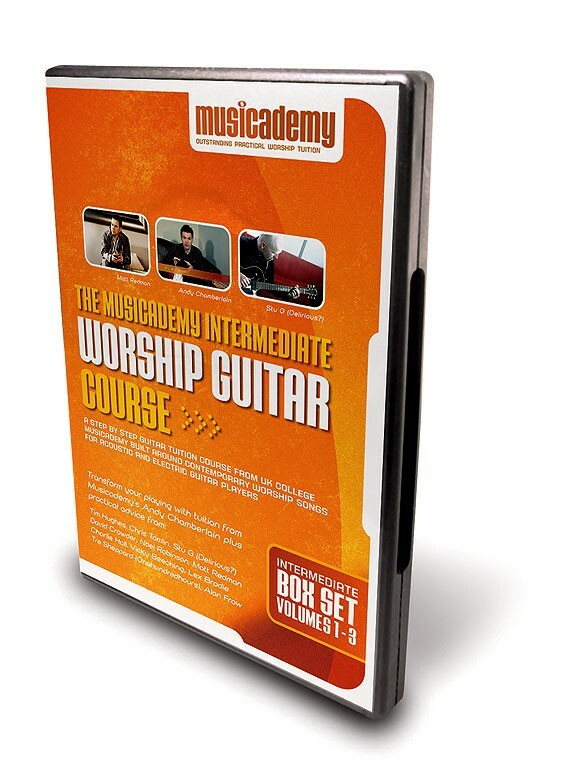 The teaching is built around contemporary worship songs for both acoustic and electric guitar, however the learning is geared more towards electric techniques and know-how. Featuring additional backing tracks, drum grooves and instrumental worship songs as a daily practice tool. Note that this is our Original Intermediate Guitar course. Since then we have produced two separate volumes - one for acoustic guitarists and one for electric guitarists. Learn about the difference here. ALSO - Practical advice from worship leaders Matt Redman, Chris Tomlin, David Crowder, Charlie Hall, Tim Hughes, Vicky Beeching, Tre Sheppard from Onehundredhours, Lex Buckley, Noel Robinson and Alan Frow. Playing by ear (theory one) - What is a key? Majesty with Stu G of Delirious? Backing tracks, drum grooves and instrumental worship songs as a daily practice tool. Quick tips and advice from Musicademy's Andy Chamberlain as well as worship leaders Tim Hughes, Chris Tomlin, Stu G (Delirious? ), David Crowder, Noel Robinson, Matt Redman, Charlie Hall, Vicky Beeching, Lex Buckley, Tre Sheppard (Onehundredhours) and Alan Frow. This course is more technically in-depth than our alternative Intermediate Acoustic Guitar Course and gives you lots of techniques and ideas that will blow wide open your understanding of where you can go on the instrument. So it covers things like the CAGED chord system which allows you to find ANY chord anywhere on the neck, 5 separate pentatonic scale shapes so you can play lead guitar to any song in any major or minor key, how to use DADGAD tuning in worship, guitar effects, a simple guitar friendly music theory system so you can understand what chords are available to use in ANY key and most importantly how apply that system to learn to get away form the chord chart and learn to play by ear. Acoustic and electric guitarists who have hit a plateau in their playing and want to extend beyond their comfort zone. You should be comfortable with basic chords, bar chords and able to play along in time with most worship songs. You do not need to know how to read music or have any prior knowledge of music theory or electric guitar techniques to access this series. This is all taught in an easily accessible style. 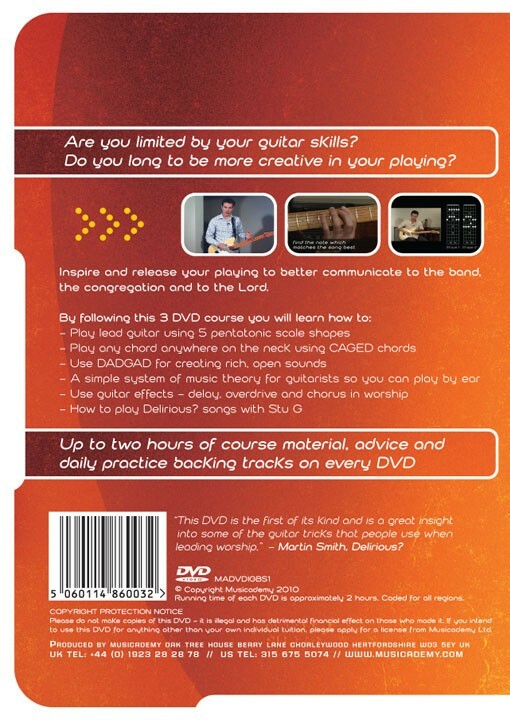 These DVDs will help those who have reached a threshold in their playing and what to develop new techniques as well as learning to play by ear. This course is more technically in-depth than our alternative Intermediate Acoustic Worship Guitar Course and Intermediate Electric Worship Guitar Course and gives you lots of techniques and ideas that will blow wide open your understanding of where you can go on the instrument. So it covers things like the CAGED chord system which allows you to find ANY chord anywhere on the neck, 5 separate pentatonic scale shapes so you can play lead guitar to any song in any major or minor key, how to use DADGAD tuning in worship, guitar effects, a simple guitar friendly music theory system so you can understand what chords are available to use in ANY key and most importantly how apply that system to learn to get away form the chord chart and learn to play by ear. What's the difference between this and the other Intermediate Guitar DVDs? This was the first Intermediate Guitar DVD we made and as such it works for both acoustic and electric guitarists. There is some overlap with the others, but with this one now at half price, there is plenty unique here that makes it worth getting hold of. Once the current stock is sold, that's it so do buy now if you would like this product. I was issued a challenge to learn more I respect to my guitar playing so I bought this box set. I have played guitar in worship for many years and have learned a lot, but this course haas taken me to another level and really challenged me. So I am very grateful for the course and am still working my way through it, not got to disk 3 yet! I highly recommend this course if you want to learn more about playing guitar. Skills and tips for practice are very practical and clearly conveyed. Andy has done an excellent job. The interviews give encouraging messages to musicians. Continued practice needs persistence and encouragement. The guests in the interviews always give encouragement and good advice. This is good solid set of instructional DVDs that are really easy to follow with great diagrams. The content is gold for anyone wanting to progress from acoustic into electric and pick up some great enhancing tips for acoustic. But... the DVD video quality is really grim. The content is fantastic, but the cameraman keeps zooming in and out like he's on a boat, the colour is a bit washed out and it's very YouTube in your living room. Andy pick up the video quality and these DVDs will be unbeatable! That said, the content of what guys like Matt Redman and David Crowder etc have to share is brilliant stuff! Very fair comment Ian,. This was the first set of DVDs we produced about 7 or so years ago now. We've learnt a lot in the process and you'll find the production quality on the new Ibtermediate electric and intermediate acoustic (as well as our other new titles) bears no resemblance! Obviously these older titles are now discounted very heavily. 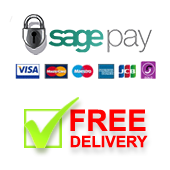 There is still some great learning on them and we feel they are still good value for money. Take a look at the newer titles and let us know what you think. Hopefully you'll still be able to say they are unbeatable! This is all I could have hoped for, the DVDs are expensive so I got the Marked down edition and it's excellent! Can't beat this set as far as value and ease of use go. Instructions, teaching and techniques are all clear and accessible. I feel like it gave me the tools to take my playing to the next level. This set covers a wide range of Guitar techniques and theory and is a steal for the price. The only reason for the 4 in Effectiveness is that because of the breadth of the set it takes a little extra digging and practice on your own to take it to the next level. Bought this after trying to use free videos etc off the internet to improve my playing after coming to a musical dead end. It covered some stuff I already knew, or thought I did, but explained the mechanics and theory better than any of the free stuff. I'm a third of the way through and annoying my wife with my refound addiction to guitar thanks to these DVDs. I bought this box set a handful of months ago and I'm still getting great material out of it. I highly recommend this product. I bought this box for myself as a lead guitar worship leader. I find myself using this all the time. Very easy to use as each lesson can be viewed seperately. 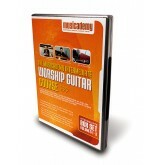 Good investment for any Church with a guitar worship leader!